How to Waterproof a Basement DIY - Armored Basement Waterproofing, LLC. 1 – Lower the water table by installing a sub floor pressure relief system. These systems are commonly called a French Drain or Drain Tile System. A quality basement waterproofing system is designed to direct water through the system to the sump pump and out of your basement. The system should intercept the energy from the water and redirect it in your benefit, like martial arts. The water fights its way in and you nudge it through your system and right out of the drain pipe. Over time, water moves mountains and carves landscapes. That being said, systems that claim to stop water are only temporary at best. Liquid waterproofing materials, the ones that are painted on, only provide a barrier and do not rid your basement of the water. The water will gather, build pressure, and find another way into your basement. Additionally, the applied waterproofing materials will eventually breakdown and you will be left with water in that area, again. 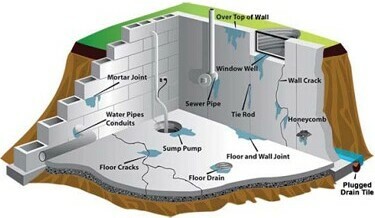 The only true protection is a basement waterproofing system that channels the water away from your home. 2 – Drain water from the wall. Your system need to include drilling holes in each core of the lowest course of concrete block on your basement walls. These holes relieve the water pressure at the lowest course and essentially drain water from inside the wall. Some systems without the drainage holes all water to continue to seep in from the outside, fill the wall, and seep through to your insulation and framing. Failing to remove the water from your wall can lead to hazards such as mold and deterioration. If your basement waterproofing system does not account for capillary action or hydrostatic pressure (coming up from the ground) and rain water or snow melt from the sides (and eventually below), you do not have a complete system. A system that only accounts for one of these symtoms is only half a solution. At Armored Basement Waterproofing, we provide a complete waterproofing solution that defends against all sources of future water intrusion. We deftly redirect water from the ground and your walls into and through our system. We provide additional protection by installing window drains, stairwell drains, Dura Skrim or Vinyl wall coverings, battery backup systems and more advanced sump pump alarms that can actually text you if there is a problem. We have zero salesmen on staff and we offer zero sales pressure. Proudly serving Baltimore, MD and surrounding areas.